Knit for Warm Up America! It drapes like a shawl, but it's actually a shrug, crocheted with two strands of worsted weight yarn on a Q hook. 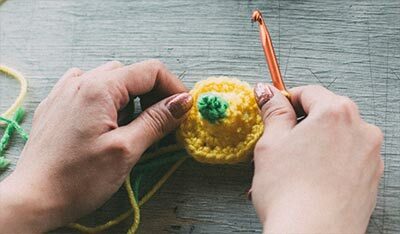 Have fun crocheting this Make It Quick pattern: for a tweed look, blend different solid colors or variegated shades, and for added texture, mix a brushed yarn with a smooth. Hooks: Size K and Q or size to obtain gauge. Please note: Yarn usage may vary depending on the type of yarn you select or on your particular yarn techniques. In double crochet with size Q hook, 5 stitches = 3"
Finished Size: 57 (61, 65)" from cuff to cuff; 26" wide. 1. Use size Q hook for main section and cuffs of Shrug. 2. Cuffs are 4" wide each and are worked last. 3. Use one strand each of A and B held together throughout. 4. Picot edging is worked on top edge only with size K hook. Fpdc: Yo, insert hook from front to back to front around post of stitch and complete double crochet. Bpdc: Yo, insert hook from back to front to back around post of stitch and complete double crochet. Dc dec: Keeping last loop of each on hook, work double crochet in next 2 stitches, yarn over, draw through all loops on hook. With size Q hook, chain (ch) 41. Row 1 (Right Side): Double crochet (dc) in 4th single crochet (sc) from hook and in each ch across; turn -- 39 stitches (sts). Row 2: Ch 3 (counts as first dc), working in front loop only across, work 2 dc in next st, dc in each st to last 2 sts, 2 dc in next st, dc in top of turning ch; turn -- 41 sts. Row 3: Ch 3 (counts as 1st dc), working in back loop only across, work 2 dc in next st, dc in each st to last 2 sts, 2 dc in next st, dc in top of turning ch; turn -- 43 sts. Row 4: Ch 3 (counts as 1st dc), working in front loop only, dc in next and every st across; turn. Row 5: Ch 3 (counts as first dc), working in back loop only, dc in next and every st across; turn. Repeat Rows 4 and 5 until approximately 46.5 ( 50.5, 54.5)" from beginning, ending after a repeat of Row 4. Dec Row 1 (Right Side): Ch 3 (counts as 1st dc), working in back loop only across, dc decrease (dec), dc to last 3 sts, dc dec, dc in top of turning ch turn -- 41 sts. Dec Row 2: Ch 3 (counts as 1st dc), working in front loop only across, dc dec, dc to last 3 sts, dc dec, dc in top of turning ch; turn -- 39 sts. Row 1 (Right Side): Ch 3 fpdc in next dc, (skip next dc, bpdc in next dc, skip 2 dc, fpdc in next dc, skip next dc, bpdc in next dc, skip next dc, fpdc in next dc) 4 times; turn leaving remaining st unworked -- 17 sts. Row 2: Ch 3,* fpdc in next st, bpdc in next st; repeat from * across; turn leaving turning ch unworked -- 16 sts. Row 3: Ch 3, * bpdc in next st, fpdc in next st; repeat from * across, bpdc in last st; turn leaving turning ch unworked -- 15 sts. Row 4: Ch 3 (counts as 1st dc), * bpdc in next st, fpdc in next st; repeat from * across; turn leaving turning ch unworked. Row 5: Ch 1, sc in each st across. Fasten off. Work 2nd Cuff in same manner on opposite side of Main section beginning edge. Sew cuff seams leaving side of Main Section open. Picot edging: With size K hook and working from cuff-to-cuff on one long edge only of Main Section (this will become top of shrug), * 2 sc in side of 1st row, at ridge work (sc, ch 3 slip stitch in sc just made for picot); repeat from * across ending with 2 sc in side of last row. Fasten off. Weave in all ends. Every effort has been made to ensure the accuracy and completeness of these instructions. We cannot be responsible, however, for variances in individual techniques, human errors or typographical mistakes. If you experience problems, visit our Troubleshooting page. 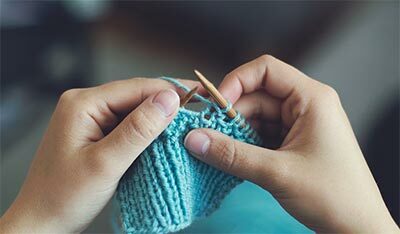 The Craft Yarn Council (CYC) represents the leading yarn companies, accessory manufacturers, magazine, book publishers, and consultants in the yarn industry. Web site ©2009–2018 Craft Yarn Council. Discover is a registered trademark of Craft Yarn Council.